For decades, scientists and farmers have attempted to understand how a bacterial pathogen continues to damage tomatoes despite numerous agricultural attempts to control its spread. Pseudomonas syringae pv. tomato is the causative agent of bacterial speck disease of tomato (Solanum lycopersicum), a disease that occurs worldwide and causes severe reduction in fruit yield and quality, particularly during cold and wet springs. In the spring of 2010, for example, an outbreak in Florida and California devastated the harvest in those areas. "There is not much that can be done from a farming standpoint," said Dr. Boris Vinatzer, associate professor of plant pathology, physiology and weed science, and an affiliated faculty member with the Fralin Life Science Institute at Virginia Tech. "First, farmers try to use seed that is free of the pathogen to prevent disease outbreaks. Then, there are some disease-resistant tomato cultivars, but the pathogen has overcome this resistance by losing the gene that allowed these resistant plants to recognize it and defend themselves. For the rest, there are pesticides, but the pathogen has become resistant against them." So how exactly has the pathogen evolved to consistently evade eradication efforts? This is where science steps in, and a copy of the bacterial pathogen's game plan is crucial. Thanks to the collaborative work of Dr. Vinatzer, Virginia Bioinformatics Institute computer scientist Dr. Joao Setubal, assistant professor of statistics Dr. Scotland Leman, and their students, the genomes of several Pseudomonas syrinage pv. tomato isolates have been sequenced in order to track the bacterial pathogen's ability to overcome plant defenses and to develop methods to prevent further spread. Bright light arouses us. Bright light makes it easier to stay awake. Very bright light not only arouses us, but is known to have antidepressant effects. Conversely, dark rooms can make us sleepy. It's the reason some people use masks to make sure light doesn't wake them while they sleep. Now researchers at UCLA have identified the group of neurons that mediates whether light arouses us — or not. Dr. Jerome Siegel, a professor of psychiatry at the Semel Institute for Neuroscience and Human Behavior at UCLA, and colleagues report in the October 26, 2011 edition of the Journal of Neuroscience that the cells necessary for a light-induced arousal response are located in the hypothalamus, an area at the base of the brain responsible for, among other things, control of the autonomic nervous system, body temperature, hunger, thirst, fatigue — and sleep. These cells release a neurotransmitter called hypocretin, Dr. Siegel said. The researchers compared mice with and without hypocretin and found that those that didn't have it were unable to stay awake in the light, while those who had it showed intense activation of these cells in the light but not while they were awake in the dark. This same UCLA research group earlier determined that the loss of hypocretin was responsible for narcolepsy and the sleepiness associated with Parkinson's disease. But the neurotransmitter's role in normal behavior was, until now, unclear. "This current finding explains prior work in humans that found that narcoleptics lack the arousing response to light, unlike other equally sleepy individuals, and that both narcoleptics and Parkinson's patients have an increased tendency to be depressed compared to others with chronic illnesses," said Dr.
Scientists of the German Cancer Research Center have discovered an alternative mechanism for the extension of the telomere repeat sequence by DNA repair enzymes. The ends of the chromosomes, the telomeres, are repetitive DNA sequences that shorten every time a cell divides during the process of duplicating its genome. 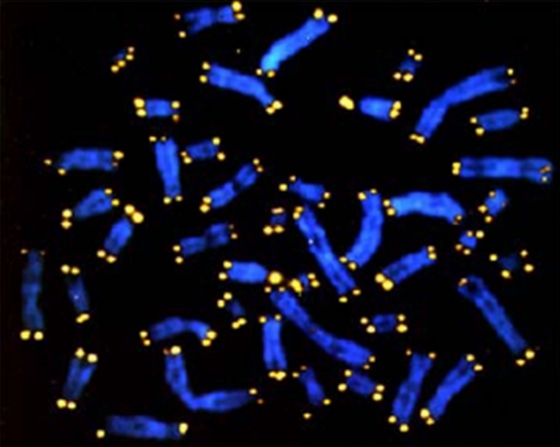 Once the telomeres become very short the cell stops dividing. Thus, telomeres work like a cellular clock that keeps an eye on the number of cell divisions. And once the cell's time is over it can no longer divide. Circumventing this control mechanism is crucial for tumor cells in order to proliferate without limits. In the majority of tumors this is accomplished by reactivating telomerase, an enzyme that normally extends the telomeres only in embryonic cells, and thus resets the cellular clock during development. However, a 10-15% fraction of tumors keeps on dividing without telomerase by making use of what is called the ALT-mechanism for "Alternative Lengthening of Telomeres". The hallmark of ALT cancer cells is a special type of complexes of promyelocytic leukemia (PML) protein at the telomeres that are termed ALT-associated PML nuclear bodies or APBs. ALT-tumors can be identified by the presence of APBs on fluorescence microscopy images since normal cells do not have these structures. However, the function of APBs has remained mysterious. In a recent study, Dr. Inn Chung and Dr. Karsten Rippe from the German Cancer Research Center, together with Dr. Heinrich Leonhard from the LMU in Munich, applied a novel approach to study APBs. They succeeded in artificially making APBs in living cells by tethering PML and other APB proteins to the telomeres.